The 2012 George Devine Award for Most Promising Playwright has been won by Tom Wells for his play The Kitchen Sink, it was announced today (29 May) at the Royal Court Theatre. The George Devine award is an annual award for new writing in theatre. Coming with a prize of £10,000, it is open to any playwright in the UK for an original stage play, which need not have been produced. It was set up in 1966 as a memorial to the life and talent of the founding Artistic Director of the Royal Court, George Devine. Previous winners of the George Devine Award include Edward Bond, Mike Leigh, Hanif Kureishi, Martin McDonagh, Conor McPherson, Enda Walsh, Gary Mitchell, Richard Bean, Mark O’Rowe, Lucy Prebble, Alexandra Wood and Vivenne Franzmann. random, debbie tucker green's poetic film about youth violence for Channel 4, adapted from her Royal Court play of the same name, took the Bafta for single drama at the British Academy Television Awards last night. The playscript is published by Nick Hern Books. The Bafta for Best Drama Series went to The Fades, written by Jack Thorne, who also picked up a Bafta for Best Mini Series for This Is England '88, co-written by Thorne and Shane Meadows. Jack Thorne's plays, including Bunny, 2nd May 1997 and When You Cure Me, are all published by Nick Hern Books. 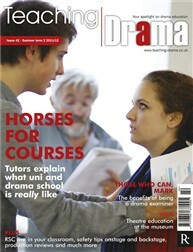 Teaching Drama magazine says our Plays to Perform site is 'really useful and easy to use', and recommends it for all teachers and lecturers looking for a play to perform. Teaching Drama is published by Rhinegold and is available here. All in Good Time - Ayub Khan-Din's big-screen adaptation of his National Theatre hit, Rafta, Rafta...- is in cinemas from today, 11 May. The film takes its title from Bill Naughton's original 1963 play, All in Good Time, on which Khan-Din based his 2007 play. Both concern a young newly-wed couple struggling to consummate their marriage, though in Khan-Din's version the action (or lack of it) takes place within an Indian immigrant community in Bolton. The play was a hit when it premiered at the National Theatre in 2007, and toured the UK the following year. Ayub Khan-Din's first play, East is East, premiered at the Royal Court Theatre in 1997 and was subsequently made into a hugely successful film. Once, the musical written by playwright Enda Walsh, was named Best Musical at the New York Drama Critics Circle Awards yesterday (7 May). Based on the 2007 film, Walsh's musical (yet to be seen in the UK) was also named Outstanding Musical at the Lucille Lortel Awards for off-Broadway shows in a ceremony on Sunday 6 May, and it leads the field in the Tony Awards with nominations in 11 categories prior to the awards ceremony on 10 June. Walsh's play Misterman is currently at the National Theatre starring Cillian Murphy in a production described as 'a fantastic, whirring monologue of small town life and flickering faith... a ninety-minute rollercoaster, kaleidoscopic in mood and construction, a perfectly realised stage poem' Whatsonstage.com. The New York Drama Critics Circle Award for Best Foreign Play went to Nina Raine's Tribes, first seen at the Royal Court in 2010. Tribes, described by the Evening Standard as 'edgy, painful and shocking', beat off stiff competition from Richard Bean's widely acclaimed One Man, Two Guvnors to take the prize, and was a strong contender even in the Best Play category, where it eventually lost out to Stephen Karam's Sons of the Prophet. Misterman and Tribes are both published by Nick Hern Books. Nancy Harris has been awarded the Stewart Parker Trust's New Playwright Bursary for her debut play, No Romance, which was premiered at the Abbey Theatre, Dublin, last year. Also recognised was Stacey Gregg, who won the BBC Radio Drama Award for her play Perve, which also premiered at the Abbey. Both plays are published by Nick Hern Books. Nancy Harris's latest play Our New Girl opened to great reviews and a sold out run at the Bush Theatre earlier this year, while Stacey Gregg's Lagan was premiered at Oval House Theatre in October 2011.